Hey, do you know if this buffer works? Apart from that, are you sure you're using a JFET with the correct pinouts? I will be building this tomorrow. I ordered the parts thursday nite so when I get all the parts in(should be Monday), I'll let you know if I got it. I ordered everything on the diagram above. I will also tell you if it works! So i built the buffer just like the layout above. The results were that I lost a small bit of high end. Not very noticeable, but in the end, I felt like i had lost the piercing shimmer of my Gretsch Penguin. I guess you can say it works but, You cant say that because its not really doing its job in keeping the pure tone. Am I right on this? Or will I never find a buffer that doesnt take away from my signal even just a little? Did you try it with the 10uF or 100nF output capacitor? At the end of the day all a buffer does is convert a high impedance signal to low impedance which helps with losses caused by long runs of cables, multiple short patch leads etc. I'm sure with some guitar/effect/amp combinations buffering your signal just doesn't sound quite as good as when it's unbuffered and this may just be one of those cases. or the Klon buffer I just posted on the blog, just to see how you feel your gear responds to them. I just used the 100nF cap. I suppose I could try a 10uF. Would that reduce "resistance" in the signal? I am also going to have a couple guitarists put this on their boards. Im going to see if they think they lose anything by having it. also, what type of IC should go in that first buffer? perhaps a TL072? hey, would this work to balance the impedance mismatch between a piezo pickup with a magnetic one do you think? Damn you. I was going to take this one down next.. :) Well. I think i can call it a day..
Hello, what is the purpose of the 100R input resistor? 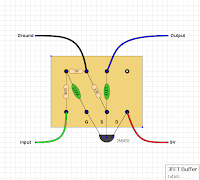 The Beavis Jfet buffer does not use one... Also what happened with the discussion about the output capacitor? should I try the 100n or the 10u? but if you intend to leave the buffer on all the time, instead of turning it on and off, would it be ok to remove it? I ran out of mpf102 and 2n5457, so I used a j201, would that be ok or this one will give me higher output impedance? what i have to do to turn the phase 180 ° so that i have a buffer that inverts the phase?